Autumn is here and that means cosy nights in, warming Pumpkin Spice lattes (a bit basic, but who cares?) and a whole heap of new wedding décor inspo to fall for. While Summer is typically high season for weddings, more couples are choosing to tie the knot as the weather gets cooler, and no wonder. You’re more likely to bag your dream venue, it's nicer to eat heartier food like traditional curries and lamb dishes when it's colder and Mother Nature’s awe-inspiring colour palette of red, oranges and golds co-ordinate effortlessly to your bridal wardrobe. If you had to pick a season that suited Asian weddings specifically, it would be Autumn. 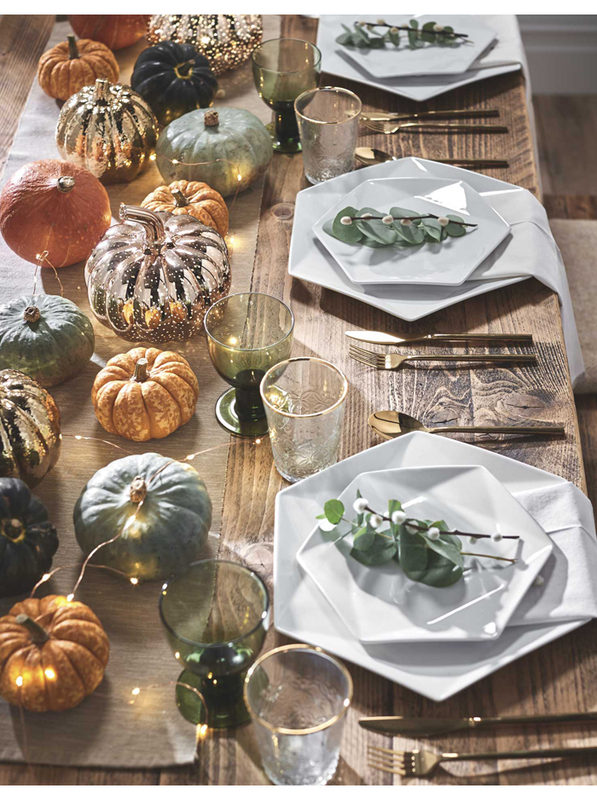 Décor-wise, there's also tonnes of inspiration aorund. Take pumpkins; when it comes to this time of year they're used everywhere from coffeeshop flavours, cooking, home décor and of course, to carve designs for Halloween. They’re also perfect for adding to your wedding décor to give your day a unique spin. You’ll be surprised at how versatile and elegant they can be – trust us, there’s nothing remotely scary about these ideas. 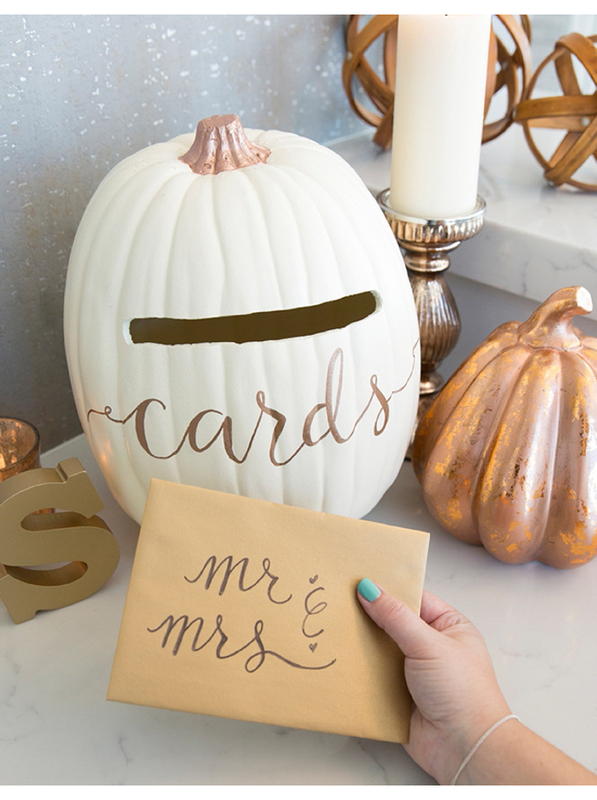 Once you’ve scooped out the insides, paint the shell in your wedding shades (or a classic ivory and gold combo), add a slot for your wedding cards/ money envelopes and add simple calligraphy. What we love most is that this takes less than 30 minutes to make! 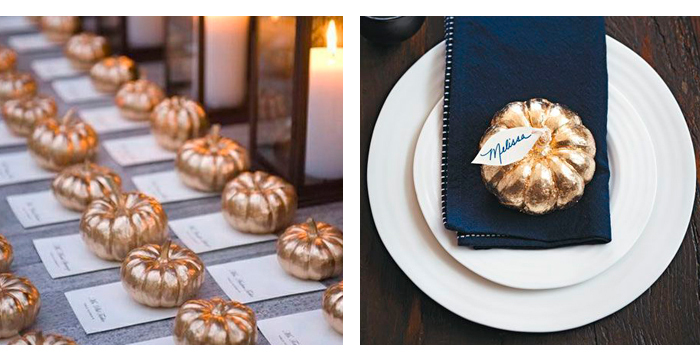 If vases or candles don’t do it for you, why not transform a humble pumpkin into a unique flower-holder for your reception tables? 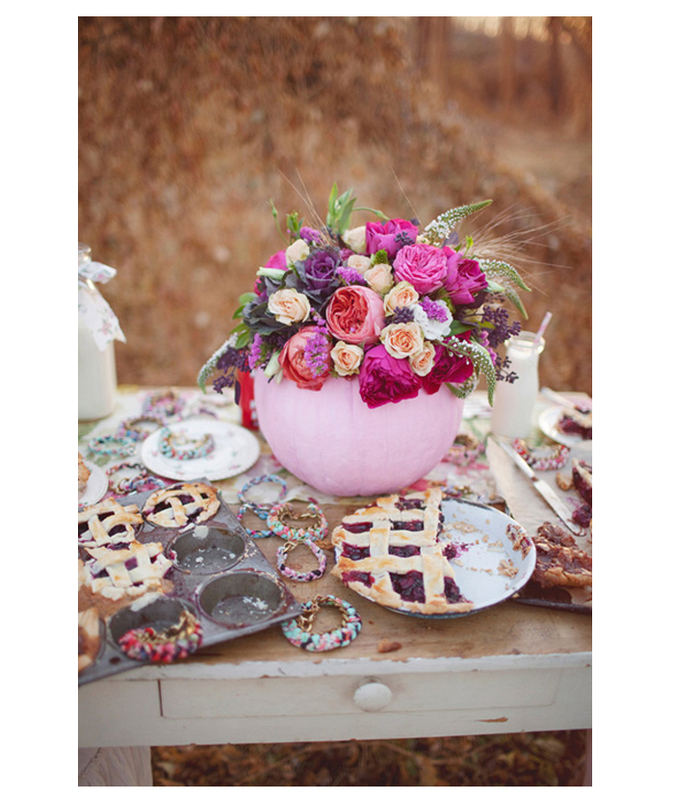 Instead of hollowing it out, secure a disc of wet floral foam above of the stem. This will keep your arrangement weighted without the potential mess of water spills. Then all that’s left to do is arrange your blooms on the foam. Pumpkins come in all shapes and sizes, including mini versions. These are perfect for making into cute name placeholders for your guests, just spritz with metallic spray paint, score into the stem so you have somewhere to place the name cards and you’re done! Display an array of pumpkin shapes and colours along your reception tables as an alternative to a traditional runner or flowers. We like the idea of painting them in lustrous metallic (copper and rose gold tones look amazing) and running a string of fairy lights through to give it a little lift. 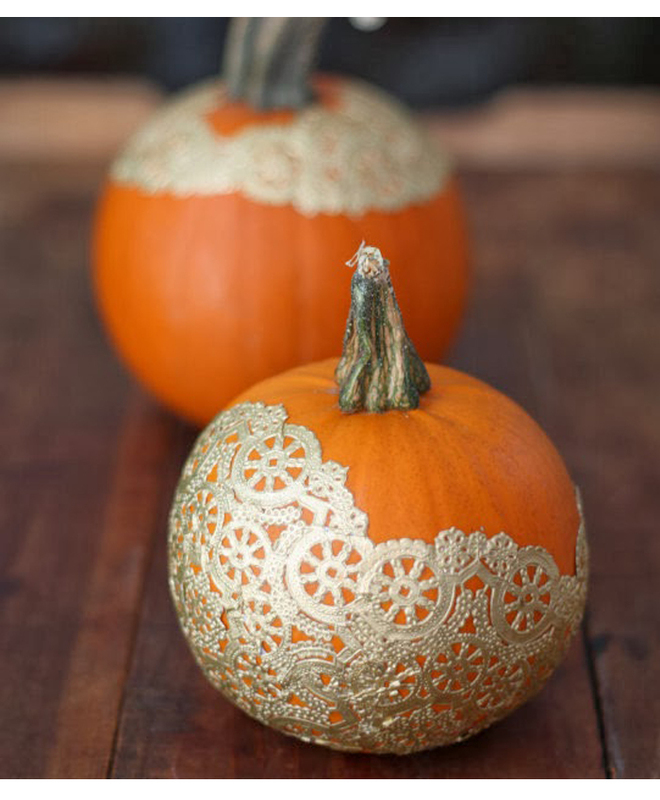 Here’s an idea we know will work fabulously for your Mehndi or Sangeet – doily or lace covered pumpkins! The pattern are just like the ones used for traditional mehndi making them so fitting for your event. What’s more, all you really need is glue and scissors to whip up this look. Got a creative side? Put it to good use and drill holes into a shelled-out pumpkin to create unique lanterns in no time. Not only will they look like little pieces of illuminated artwork around your venue, but they're super quick to make and leave more in your wedding budget to spend on fun extras, like an artisan food truck!